Worth going once, would not repeat it. We ate twice on the tour, could have done without it. Food on board definetly better. it was a very restful trip, with (almost always) very good food. Cuba is really a place to visit. We hope, there will never be a McDonald. It's just so different, simple and beautiful. The people are one of the nicest we ever met. And we traveled around a lot. The food and service was excellent. We enjoyed the cruise. This was the first time my wife and I cruised in 25 years. The new ships have become floating diners with 2500-3500 passengers on board. 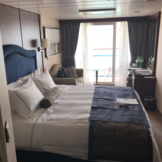 This ship had superb service, food, in a casual environment with upscale amenities. I had enjoyed it so much that I left a deposit for a future cruise. I wish I had been told how old and rundown this ship was I would never have booked this cruise I will never use oceania cruise line again trip of a life time was a great disappointment. Daily routine: 2 hour breakfast, 3 hour lunch, nap time, 3 hour dinner, 1/2 hour jazz music not suitable for dancing. Production show only has 5 to 6 persons. Guest performance is simple and lower grade and repeat. We took this cruise because of the itinerary and we had a great time and met some interesting people. This cruise had about 190+ people who were cruising around the world. For some of us who were not part of this “elite group”, felt like we were an afterthought. Everything was catered to them. But I guess, that’s understandable because that’s where the money is. But overall, our cruise was great and will cruise with Oceania again. It was a pleasant and good experience, albeit some minor issues: the ship did not dock at Corinto, Nicaragua because of some perceived troubles (security issue); however, the ship did not give credit for the port charges (on other cruises, we always received credit if the ship did not dock at a certain port), Oceania only issued credit for passengers who bought excursion tours. What a shame!!!! Overall very good. Disappointed to have missed Shanghai due to weather. Ship's staff were well trained and very accommodating. The Insignia is an older smaller ship and the cabin dimensions were tight. Food quality and presentation were very good. We really enjoyed the in-depth look into Cuba. It filled in a lot of gaps in our knowledge in spite of the propaganda. We appreciated the smaller crowds and excellent service provided on the Imsignia. We were looking for a quiet and relaxing cruise and that is exactly what we got and more, i.e. : the food, the staff and the overall beautiful ambiance of the ship. This a Is an interesting and relaxing cruise itinerary. We travel with a light weight mobility scooter and we're able to take it off the ship at all ports. The tender staff is the best! The scooter is a Travel Scoot - www.travelscoot.com. We like Oceania ant hope that they look into the reduction in number of staff. The housekeeping staff is less and it is very noticeable in the Terrace Cafe. The destinations were magnificent. A great boat for very mature people. The food was incredible, the best cruise food I have had. The activities on board were not for me at all. The entertainment was just OK, mostly singers. The staff were so but so good, all of them, they are there to please you. The food is the most outstanding part of any Oceania cruise. And this one was no exception. However, the Insignia is not quite as good an experience as other Oceania ships of the same size, particularly the Regatta. Dining and service were outstanding. The Main Dining Room and Toscana were first rate with wonderful dishes and service. Terrace café was excellent for breakfast and good for lunch. MDR was great for lunch. The High Tea was the highlight of the afternoon and eagerly awaited. Head Chef, Mario Santoro was wonderful and a constant presence. The shows were better than anticipated and the Sting Quartet were wonderful and very entertaining. The only disappointments related to the very poor handling of the Egyptian port cancellations (no notice) and the lack of help or support from the Destinations staff. Additionally, several items prominently displayed in all advertising material were not available--nor Artist in residence and no sauna. Corporate offices need to correct errors and not mislead customers on ports of call. Our recent Nordic cruise on Oceania's Insignia will be remembered as one of our favorite cruises among the many that we have taken. The itinerary was a perfect introduction to this part of the world -- taking us to places we hadn't been before. 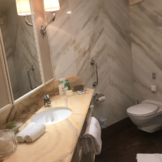 It was a nice blend of ports that featured stunning natural wonders (geysers, waterfalls, mountains and fjords) as well as cosmopolitan cities and historic neighborhoods worth exploring on foot. We enjoyed a variety of experiences on the ship's shore excursions and on our own. The ship won our hearts with its tasteful and refined decor, outstanding cuisine, and excellent service. We found it to be the perfect size for us: not too big and not too small. We appreciated its quiet, relaxing atmosphere, smoke-free venues, and the fact that there were very few children on board. 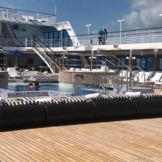 I overheard one passenger complaining about the lack of activities onboard, but we rejoiced that there was no rock-climbing wall, no non-stop disco, bingo, karaoke, art auctions, and all the other noise and nonsense of big cruise ships. We cruise for the sheer pleasure of cruising and to visit interesting ports of call. We don't need a floating amusement park. We look forward to sailing on Oceania's Insignia again someday. First, the itinerary was exceptional. An 18 day adventure including 3 stops in Canada Maritimes, 3 stops in Greenland, and finally Reykjavik. Next was the food on the ship. There are 2 specialty restaurants, Tuscana and Polo, as well as the Grand Dining Room, the Terrace Cafe (buffet), and the Waves Grill. We ate at all of them several times and the food was varied, fresh, well prepared, attractive, and tasty. Special requests were always accommodated and the service was personal, attentive, and professional. Then, I felt that everyone on the staff was personally invested in seeing to it that we enjoyed ourselves. If we had an issue, it was immediately addressed, no matter how minor. Next, our room, a penthouse suite, 322 sq ft, was very well laid out and functional. Our room staff was very efficient, friendly, and helpful. Also, we met a lot of new people. Not everyone you meet on a cruise will be your new bestie, but we met several who we will stay in touch with in the future. We were so happy with the ship, crew, and overall experience that we booked 3 more cruises before leaving the ship. So much beauty to experience in each island, so many interesting and fun people I met along the way. The experience of having a fruit buffet before returning to the pier in Nuku Hiva was unforgettable; the tour guide in Kauai was the best lecturer on the island's history (better than a book); and the afternoon on the glass bottom boat in Rangiroa was fun with lots of laughter. I met amazing and interesting people and made new friends. The staff are highly professional, committed to high standards of customer services. The only aspect that Oceania needs to improve is travel arraignments: scheduled flights, connections, and time between connections were the number one complaint from the majority of people on this trip.